I built the Emerald Night a while ago and it has sat in the box down in my basement ever since. It is a beautiful train although it really does need additional passenger cars. A month ago when I had the e-mail dialog with my Dad about the Emerald Night, he asked me how it be converted to use a 9v motor (since he has several of them). I know the Emerald Night comes with instructions on how to add a Power Function motor but (a) neither of us have the right motor and (b) neither of us feel like buying more motors when we already have 9v motors on hand. I thought about it a bit and decided trying to stuff a 9v motor in the locomotive was a fools errand. However, adding one to the tender looked pretty straight forward. I decided to poke around a bit and there is thread on LUGNET and a number of blog posts that describe various solutions to the problem. The LUGNET thread in particular is pretty involved and uses a gutted 9v motor along with Power Functions. A bit more than I am willing to take on right now although I do have several dead 9v motors. From further searching it appears there are a number of solutions depending on how close you want it the train to look compared to standard instrcutions. I am not too picky, I just want it work and not look awkward. There was an NCLUG meeting this past Sunday afternoon and I decided to take a loop of 9v track and the Emerald Night along with some parts with me to see if I could make it run. The key to my idea was to add a single wheel set and a 9v motor to the tender. Doing this meant tweaking the chassis design of the tender a bit to account for the pin on the 9v motor. The modification is pretty simple and makes use of some standard size black plates. 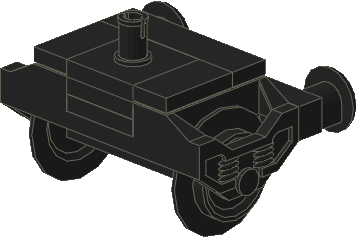 I have documented the changes to the tender chassis and produced instructions using Lpub. The instructions for the tender are not complete – they just replace steps 1-5 and eliminate steps 16-18 in the official instructions. So does it work? Sort of. I say sort of because the modifications to the tender work fine however the tender struggles to push the locomotive through the curves on the small loop. I think this is due to the large train wheels on the locomotive which are linked together via Technic axels to bind up. Unfortunately I didn’t have any parts with me that I could use to swap out the axels for simple pins which I hope will solve the problem. I hope to try this in the next day or two as I want to run the Emerald Night at LEGOPalooza. This entry was posted in CAD, Instructions, LEGOPalooza, LUGNET, NCLUG and tagged Instructions, LEGOPalooza, NCLUG. Bookmark the permalink. are all the pecies required to do this in the set? No, unfortunately not. You’ll have to use a few black plates from your LEGO collection. 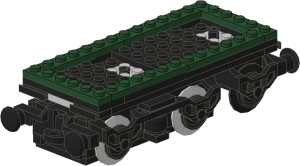 You will need some black plates from your own collection to build the modified tender. Not many through. Did you ever try out your idea of replacing the axels with smooth pins to reduce friction? How would that work, anyway? I don’t know of any smooth pins that would still have the crosshair style connections on the end required for connecting to the large wheels. I’ve tried various mods to eliminate friction and run this train with on 9v motor in the tender (similar to your design), but the train crawls at best, unless i add some weight to the tender. These include eliminating friction caused by the piston rods in the front, disconnecting the gears, and even trying a 90 degree offset of the wheel assemblies instead of the 45 degree offset mentioned in the original instructions, but none of these mods has really helped. I have not done any more work on it – my compelling event, LEGO Palooza, was rescheduled due to some unusual winter weather we had here. I expect to get back to it in the next month or so, I will post an update as soon as I can. Thanks for your response, Mike. Hope you have a great time with LEGO Palooza. It finally dawned on me what you meant about smooth pins anyway, using the same little pins that connect most of the other non-powered wheels on the train (duh). For some reason i was picturing smooth axels that went all the way through like the current axels do, but now that i understand i may try out and let you know how it goes. Looking forward to seeing what you figure out once you find the time to dig in. However, it helped lead me to my new theory, which is basically the reverse! I had previously noticed the small wheels often don’t spin well, and when removing the front and rear truck assemblies and pushing them along the track independently, they do not roll smoothly at all. That being said, I’m now thinking of switching out all the pins in the set with axels instead. It will obviously take a little modding when it comes to the front & rear truck assemblies, but i may just give it a shot. I tried to run mine last week at LEGOPalooza with some modifications to disconnect the linkage between the wheels on the left and right sides. It helped but the weight of the tender still wasn’t enough. I will add a weight brick to it and see if it helps but have to rebuild the Emerald Night first as mine was dropped on the floor during the show. Feel free to check it out and tell me what you think. Hi, ive had success by gearing the two sets of flanged wheels together. I had to make some modifications to the base but not too many. I had to cut an 8 axle to 7.5 to fit it in between the two axles of the wheels, but it stops binding, and also make no difference between 90 or 180 degrees apart. To see the difference try just rotating one wheel… it will bind quickly, once the gearing is in place it can never bind in this way. The only place I know to buy additional passenger cars is from BrickLink. They will probably be expensive as BL sellers will have purchased them from LEGO and broken them down for resale. There is a thread on Eurobricks.com (which I can’t find) where Jamie Beard, the LEGO Designer of the Emerald Night, stated that additional cars would not be made available. It is unfortunate but a fact of LEGO business. Hi. Thanks for sharing your Mod of Emerald. Based on it i have made my own Mod. 1) Open the 9V motor and carefully remove the electric motor. Close it again. 2) Install a PF XL motor on Emerald. 3) Connect a PF conversion cable to the 9v train motor plug. This will give you power from the rails. 4) Connect the XL motor plug to the PF conversion cable. great resource. I’ll be in Chicago on February and wanna buy an Emerald Night. Someone in Chicago who knows where I can buy it? I just bought the Emerald Night and want to make it run via 9v. I was wondering if you could make a list of the parts I’ll need to add to make your alteration. I would like to have them ready with the train arrives. Download the PDF of the instructions, there is a list of part (I think) at the end. If not, they appear on each step and there are not many new ones needed. Not sure if I ever noted it or not but the 9v tender worked fine but I had to make some modifications to the locomotive to get the wheels to turn correctly as it went around corners. 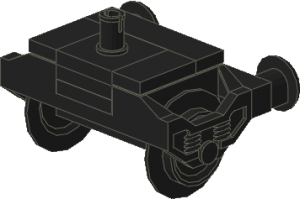 The standard instructions connect the left and right wheels with a single axle. This is fine in on straight line of track but causes the wheels to bind going around a curve. I solved the problem by replacing the axle(s) with Technic axle pins. It worked well until someone at a train show dropped mine on the floor. It still sits in a box in the state we cleaned it up off the floor in. Mike thank for responding to my post. I was able to convert my tender with on problems using your instructions. I’ve set up my EK on an tracking and started running it with to passenger cars and a caboose and it was going great for a few minutes then just stopped. I’ve tried fixing the wheels on the locomotive like you mentioned and even removed the piston that connects all the wheels. But it is still coming to a stop after a few minutes. I’m new to trains and was hoping you might be able to suggest something. I got the 9V motor used on eBay is it possible the motor is not strong enough? It seems to run fine without the locomotive in front thats why I thought it was the wheels causing the problem. The easiest way to test a motor is to run it without a train. Run the motor all by itself. It will probably be fine but if it runs really slowly then yes, you have a motor problem. If it runs fine you need to start adding some weight to it – try running the tender all by itself (without the locomotive). I’d then run the tender with the wagon before I add the locomotive. If it is binding up on a straight section of track, you likely have a motor problem. If it only stops on the curves then something is still binding that the motor isn’t strong enough to push through it. You don’t happen to have the PDF to convert the tender of the Emerald Night to 9v anymore do you? The link no longer works on the site, nor was I able to find it anywhere else on the web. Please let me know. Thanks. Yes, you can find it here. Not sure why the link is broken, I’ll have to sort that out.